Chelsea fans remember Armistice Day prior to the Premier League match between Chelsea FC and Everton FC at Stamford Bridge on November 11, 2018 in London. Not the game. That was distinctly forgettable. Normal savage service will be permanently resumed when we go to Sp*rs, but this is a blog with a difference. I’m distinctly proud of my football club, for yesterday, on the 100th anniversary of the end of the Great War, Chelsea made magic happen for four families and asked nothing at all in return. They had all lost a relative that had at the very least been a match-going Chelsea “die-hard” before WW1, and in some cases an ancestor who had actually enlisted to fight at Stamford Bridge at the behest of the club. In 2014, at the request of my publisher, with fellow Chelsea fans I began researching a book about the club and the Great War. We were never going to make any money; this was not Dan Brown territory, we can actually write for starters, but we were all WW1 researchers or at least enthusiasts and we fancied doing the work anyway. Quickly we were interested in the fans, people just like us who served, just as much as we were in former players. To research a serviceman properly, I generally try and find their family, which involves a lot of genealogical experience I started amassing at school when I was bored and should have been doing my homework, and before ancestry was even a thing; along with a bit of stalking and a creepy letter or phone call to a stranger that involves reciting their family tree to them and hoping you have found the right person and that they don’t hang up on you thinking you are a lunatic. What we found, I published in 2015 with Andrew Holmes, who was successfully swayed towards Chelsea from supporting his local club Derby by his babysitter in 1978 and has never looked back. In some cases it was easy to find who we were looking for, when men’s names had crept into the Chelsea Chronicle, which was our programme at the time and copies of which were generously shared with us by the FA at Wembley. Cecil Dean had been visiting Stamford Bridge since the club’s inception with his father William, a successful career soldier stationed nearby at Chelsea, and his younger brother. By 1914 William had retired and Cecil was a teenage soldier in the Irish Guards, sent to France in September. We found Cecil’s nephew, who shared photographs and documents with us, but yesterday, thanks to Chelsea we met his daughter Clare, and Mark, her cousin’s son, for the first time. It was all the more poignant because her father passed away as we were writing the book, but had asked her to finish what he had started, and help us commemorate their family in print. We dedicated the book to him. Clare travelled all the way from Lincoln to spend the centenary of the armistice at the ground that her great great grandfather had loved, watching Chelsea, a pastime that her great uncle had pined for from the Western Front before he was killed at the Battle of Festubert in 1915. William rejoined the army after his eldest son was killed, he served during the Battle of the Somme, and when he finally retired for good after the war, this Blue had served his country for more than thirty years. Harry Trusler was a very early war recruit, another teenager. From near Basingstoke, he made the journey up by train via Wimbledon like so many fans do now to watch his club. He joined the Royal Marines, and survived chaos at Gallipoli. In fact, he survived from the beginning of the conflict until almost the end, when he was killed in the final advance to victory at the age of 22. Three members of his family were invited to Stamford Bridge for yesterday’s game: his great nephew Dennis, who first came to Stamford Bridge himself in the 70s, his wife Sue and son Mike. To find the men who enlisted in Kitchener’s New Armies, the ones that answered repeated match day calls at Stamford Bridge to join the war effort, our job got much, much more difficult. In fact; it is the most intricate bit of research I’ve ever done, and I don’t think it will ever be surpassed in that respect. The Footballer’s Battalion, which was designed for pros to serve together and to encourage fans to join them, was formed in part by representatives from Chelsea at Fulham Town Hall at the end of 1914. We knew that someone had claimed that before the date when the number of men reached 1500, 150 odd were Chelsea fans. Using service numbers, we identified the first 1400 to be safe, and went about researching every single one, weeding those from the area around Stamford Bridge out of the pile for further research; setting aside those who lived next door to White Hart Lane, or Woolwich Arsenal, and the large group who were very obviously clustered around Clapton Orient, who we knew contributed as many fans as we did. Here’s where we should have reached a brick wall. British Army service records for WW1 are to a large extent, gone. The Luftwaffe bombed them in the Second World War. They caught fire. Then the fire brigade turned up and covered them in water. And yet. Fate seemed to have conspired to help us succeed. Nobody knows in what order they were stored, but with just a few exceptions, every time we went looking for a man in the Footballer’s Battalion’s service papers, we found them. We identified 100 men who lived and worked in the area directly surrounding Stamford Bridge. We could identify the ones that had enlisted in the army around matchdays. And we started taking a closer look using all our best stalking techniques to find the families of the best candidates to corroborate our theory about their Chelsea connections using their knowledge. One of these men was Patrick Ronan. Pat was a costermonger (market trader with a mobile stall) on North End Road. Yesterday his grandson John and his lovely wife Jan were brought up to Chelsea. I don’t know if John thought he’d ever see another game at Stamford Bridge. He used to live on Fulham Road, he was at the ground week in, week out. He remembers more than 70 years ago being warned with his classmates about what would happen to them if they bunked school to go and watch the famous friendly against Dynamo Moscow in 1945. It was a happy reunion for myself and Holmes, for we had been to visit them when we were researching the book and seen some incredible artefacts from the war that had belonged to Pat. His was a realistic story of enlistment in the war. He couldn’t find anything to sell on his stall once it began, prices went up, he and his wife Annie had two children to support. He joined the army outside Stamford Bridge because the money was regular, more than he was getting, and he needed it. I never thought I’d get to introduce John to Roger, another friend we made whilst we were working on the Footballer’s Battalion, invited up from Cornwall with his wife Gerry yesterday by the club. Roger’s grandad served side by side in the Footballer’s Battalion with John’s throughout the Battle of the Somme. Sid Jerram and his brother Bert lived on Avalon Road, yards from Stamford Bridge. They bounced home from the ground one day and declared to their mother that they had joined the army at a match. To say that she was unimpressed would be a massive understatement. She needed their incomes to keep the family going, and this rocked the boat. Along with Pat Ronan they survived the horror of Delville Wood in late July. When an attack was launched at Guillemont in August, Roger’s great uncle Bert was killed, and Pat wounded. He’d returned to the battalion in time for the final attack on the Somme in 1916. On that day John’s grandfather was killed. The last letter from his wife, bloodstained, was taken by a comrade and sent home to Annie; and was shown to us by John whilst we wrote the book. That Dynamo Moscow game? John didn’t tell us if he dared to bunk school, but that game took place on the 29th anniversary of Pat’s death. On the same day, 13th November 1916, Sid Jerram was relieved to be wounded and taken prisoner. His war was over. He wasn’t going to die. Tomorrow will mark 102 years since that battle. Yesterday’s guests were not just invited to the game. Led by Director of Communications and PR, Steve Atkins, the club rolled out the red carpet. There were no media requirements or appearance duties for them. In Steve’s words, it was an act of remembrance on the clubs part and it would not have been right to use it for publicity. I wanted to write about their families though, and they were keen that I wrote this article. Clare said that she thought people ought to know what was done in memory of her ancestors and the other men commemorated by Chelsea. They were treated to pre match hospitality and a fantastic welcome from the club. Their seats were “amazing”, and the club helped me shift for the day to be with some of them close up to the home dugout. John was amazed at the speed of the game. He said he that remembered seeing Tommy Lawton just after World War Two, but that he wasn’t as quick. We did agree that the ball probably weighed half a stone back then. Roger has been away from the Bridge a long time too, and when The Liquidator started he said “God, they still play this!” As Steve reassured some of us later, that’s not going anywhere. Both were not happy to see that the away fans were in the shed. I reassured them that we moan about it constantly and that it’s all you-know-who’s fault. John’s wife Jan, who I had the pleasure of sitting next to as they held hands and watched the game, knows her football too. They keenly follow Chelsea from home. It was wonderful to see that no matter how long you are away, half an hour and all the passion comes flooding back. Jan was distinctly unimpressed with Everton’s lengthy “injuries.” As far as John is concerned, the ball went in the net. It was 1-0 and no linesman’s flag is going to tell him otherwise. On my other side, Roger was furious with Kevin (Not My) Friend blowing the whistle every time they fell over, and when they broke in injury time he blurted out “kill ‘im!” As an Evertonian went sprinting down the wing. Those of us that go week in week out always say that the football itself is such a small part of the day, that it’s not just about the result and that it’s about spending time with the football family that we’ve made for ourselves. This was never more true than yesterday. After the game Harry Trusler’s family joined us from their seats, as did Andrew and his wife and son from the Shed. (They deserved their day out as much as anyone, as I basically commandeered him for the entire centenary period and put him to work writing books with me) Chelsea could not have done more to make this day memorable for all involved. The families watched the manager’s post match comments, posed for memorable photos together on the pitch. They were joined variously by Gianfranco Zola, N’Golo Kante, Antonio Rudiger, David Luiz and Ross Barkley, who all made time for them. Andrew’s son Adam went from shaking with excitement to full-on teenage selfie mode. Then it was up to the director’s lounge for a champagne toast to William, Cecil, Harry, Pat, Sid and Bert. Their families had the opportunity to pose with trophies that those men never could have imagined when the war began and the club was a mere nine years old and more than forty years away from our first league title. Roger had mentioned earlier that His grandad and his great uncle were just twi of thousands, but as I told him yesterday they were representatives of all those affiliated with Chelsea who answered the club’s call 100 years ago. There were some tears yesterday, for those relatives that were lost; for those that survived, but bore obvious scars from their experiences, but I think also because the reception from the club in their memory was so overwhelming. But there were smiles too, at the thought of what they would have made of their descendants being guests of honour at their football club because of what they did. From start to finish the people that helped Andrew and I commemorate the contribution of Chelsea Football Club in the Great War in print were warmly welcomed by absolutely everyone they came into contact with. 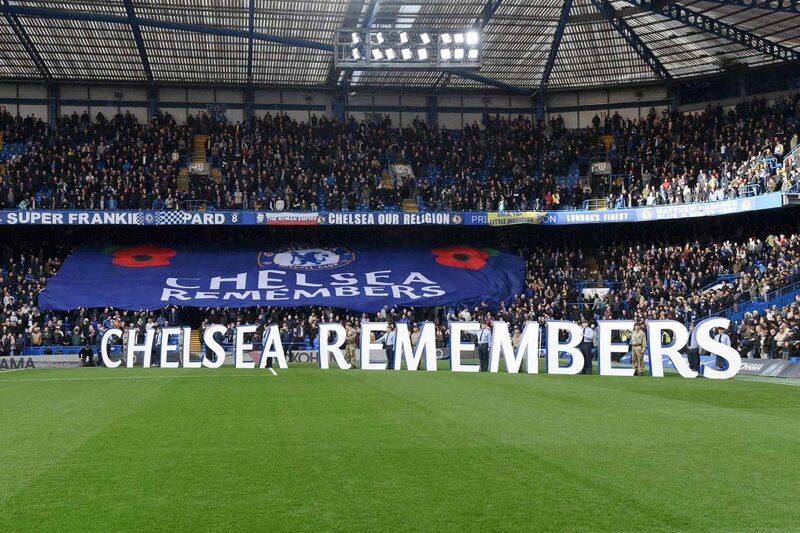 They won’t forget the experience, neither will we, and as Chelsea proved yesterday, neither will the club forget the sacrifices made a century ago in the Great War. If you want to learn more about the men mentioned, as well as dozens of others affiliated with Chelsea in WW1, the book is available on Amazon – Over Land and Sea: Chelsea FC in the Great War.